So I'm curious to see what everyone's "Battle Station" looks like. 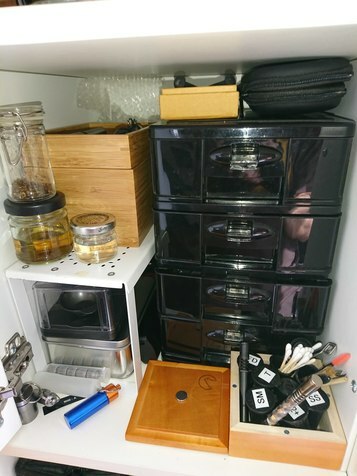 Whether is a desk, a drawer, a travel case or a cabinet where do you store your vapes and accessories and why? Also where do you find you consume cannabis the most? 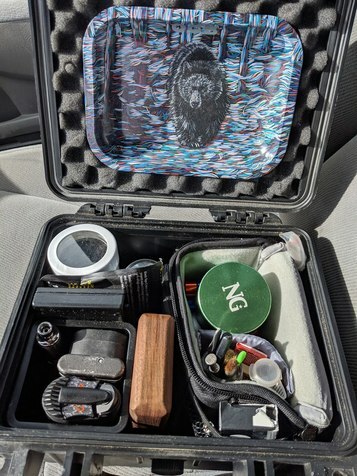 Personally I use this small waterproof hardcase to carry all my vapes and accessories. 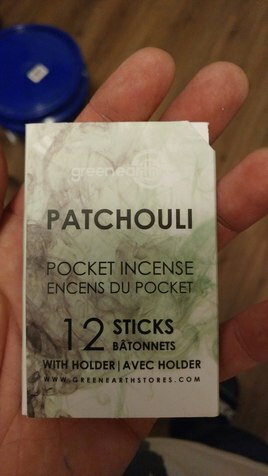 It's super easy to bring too and from friends houses and also super easy to use on the go (P.S. yes I still have rolling papers and filters, sometimes it's just easier to smoke a J :D ). I'll post a picture of everything removed later when I get a chance so you can see all the crap I cram into here. But for now I'll just make a list. -A few small dollar store glass jars for my flower, they hold about 7G each. -2 Small jars that contain dry-sift kief. 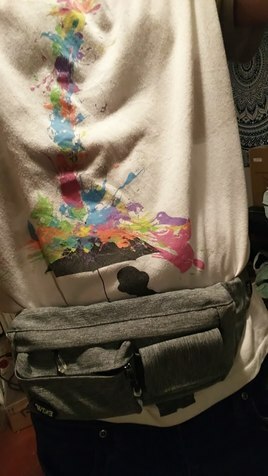 -Some extra screens and stuff are hidden inside the little camera bag. I really wanna get something like this. Is that a pelican case ? I was thinking about that option. But I recently saw a knife collection box made out of wood that made me drool but I don’t have enough Vapes to fill it. 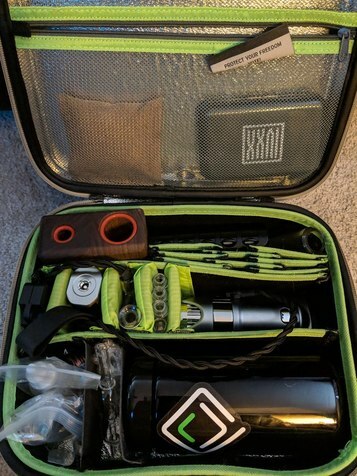 Currently I store my Vapes in a ryot hard case but all my Vapes don’t fit :sad: . It's not a pelican but the same style. 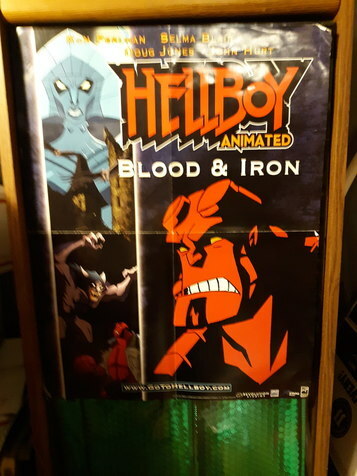 I picked it up at a local Princess Auto for around $20CAD. I would never pay those ridiculous pelican prices for a big hunk of plastic. I think I've heard in America that Harbor Freight is the place to look for something like this. 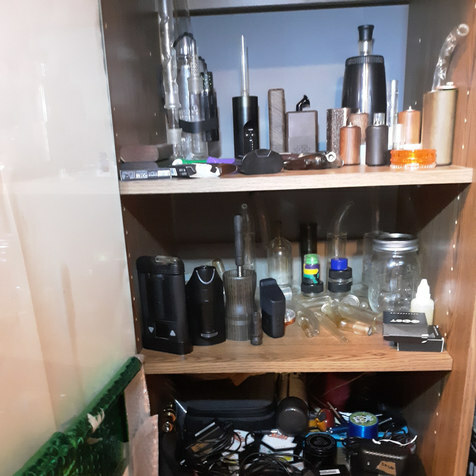 That's starting to look like Troy form 420VapeZone's shelf. Amazing collection! Thanks. :rofl: Troys shelf is much bigger. But ya gotta start somewhere. its always easy to grab and i never knock it down! Is that a Stealth MV1 I see there hiding in the shadows? 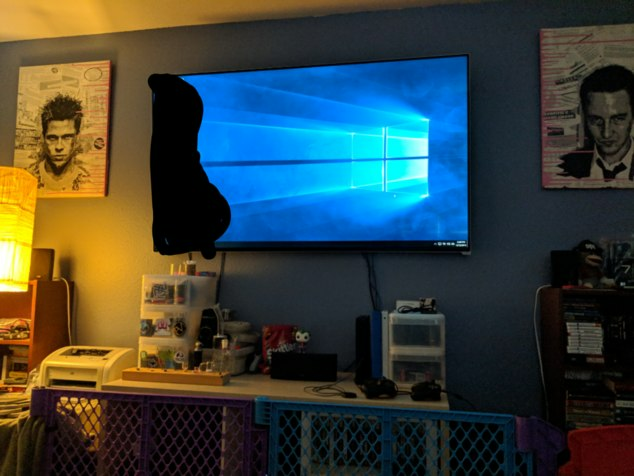 I JUST finished cleaning up my setup, because it tends to get spread out over it's home. I'm mostly in my upstairs office gaming, practicing guitar, and occasionally working. I've got a table wired up for the email and also to hide my keyboard/mouse wires. This is the main station, with everything living on the entertainment cabinet when not in use. Most everything useful can be stored in my locking StashLogix bags. That and the security gate keeps away interested little eyes if they break into the office. 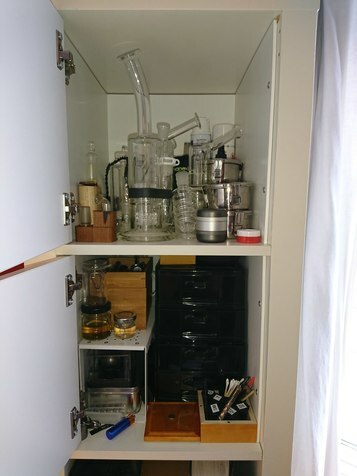 The bins store my glass attachments and adapters, extra oz, rarely used accessories, and cleaning products. 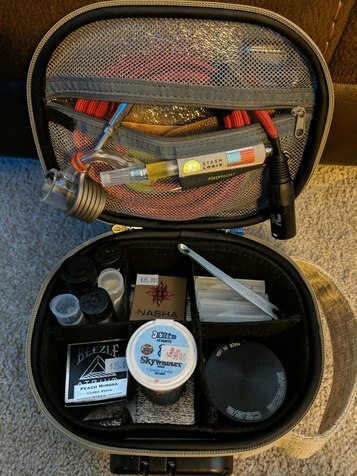 My vape gear. My smoking stuff sits unloved and unappreciated in a draw. I mostly just like that all the bits little ones could get in trouble with can be locked in something that still looks nice and is portable. I prefer minimal when I'm out and the most important ever take is a cartridge and battery. Haha I dont have enough stuff to make a dedicated corner. 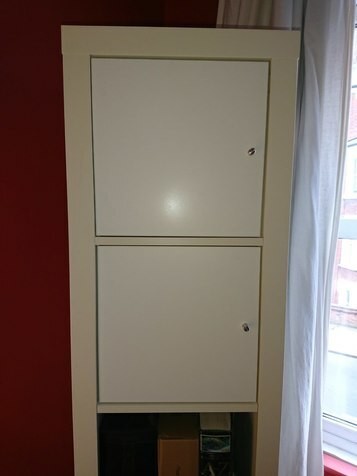 All done at my Ikea table! 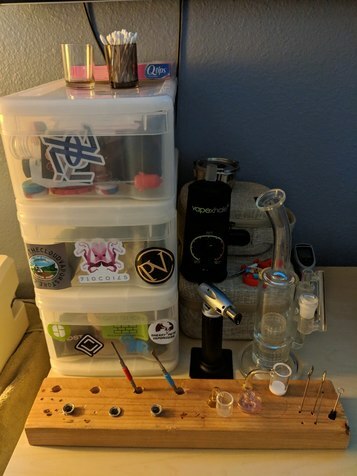 All my vapes are either on my work desk, or in my desk drawer, the ones I rarely use are in a closet, my rosin press in in my bedroom. 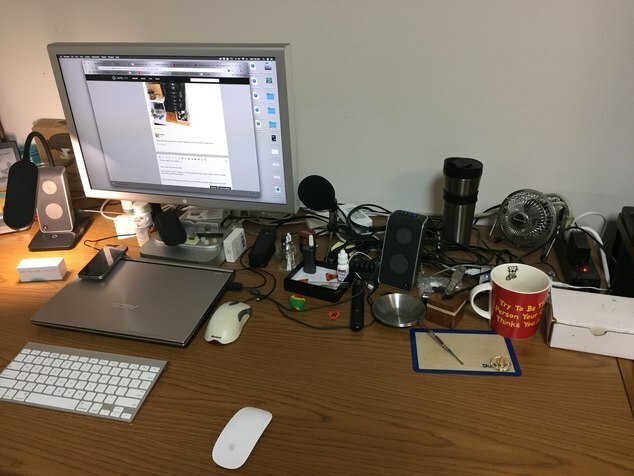 But here is a real-time pic of my desk as I post this. I'd break that glass before I could fill it with water :lol: but damn would I love to hit it. It's sweet! 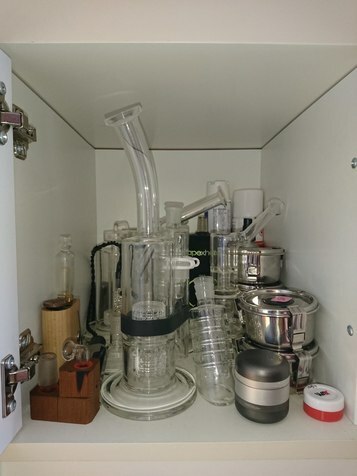 I call it "El Dose" - The Twelve (recycler tubes). In dabbing, I like intensity, and that means relatively big dabs. I've probably graduated onto "Sophomore" or "Junior" status with respect to quartz. I've become utterly fascinated by the varying effects different bangers and even carb caps have upon the final dab. Like some people get VAS, I think I am beginning to suffer/enjoy some sort of QAS ("quartz acquisition syndrome)? lol. 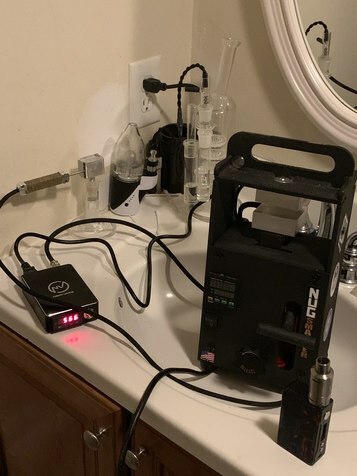 I once thought a $20 banger was splurging, but now I've learned on american quartz, it is easy to spend $150 on one banger and cap. So still learning. 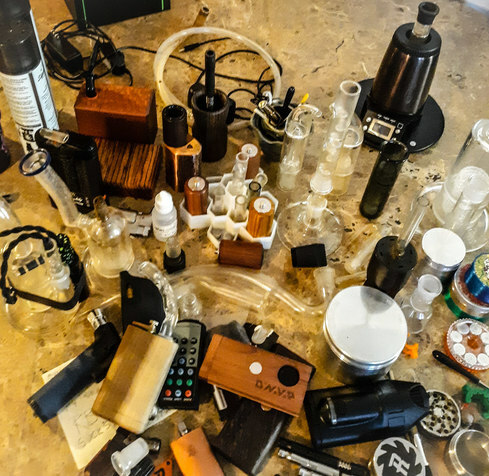 Oh, and did you catch all the vapes in my pic. 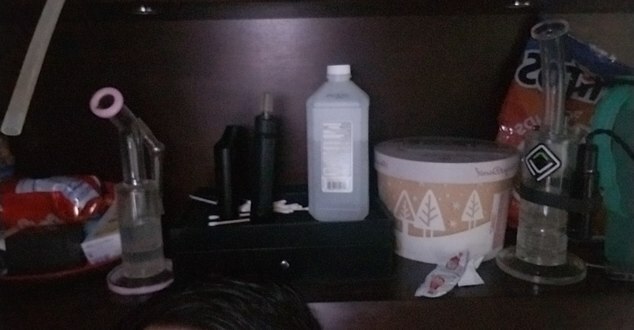 Got a G43, a FF2, Omni, and a Ccell Silo on that desk. im mad cheapo for my bangers, but i like to keep it trippy. 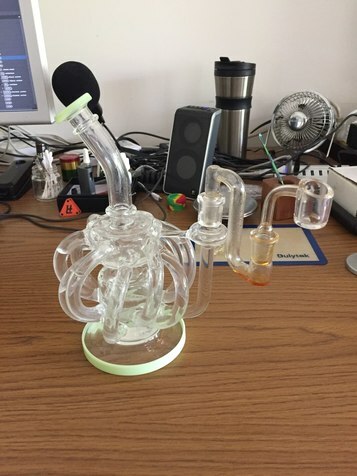 I've not tried a "recycling banger" (not rig) yet. pretty soon efficency wont be a priority for me. 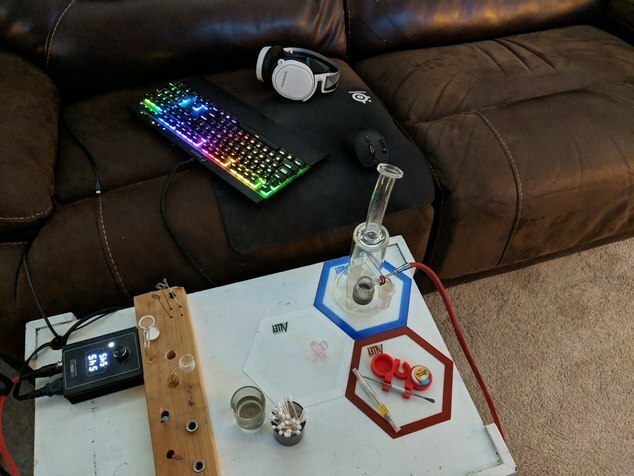 I bought the terp cyclyer in advance. I will more then likley use it once or twice and then sell it. The kids at work are hyped about it and dont care that i buy low and sell high. LOL. I've never even thought of buying used quartz? I must ponder?